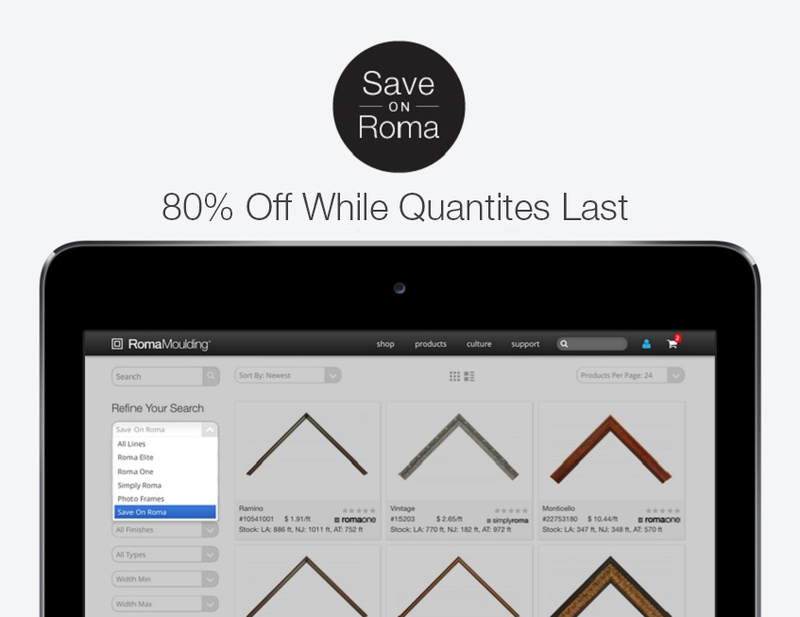 80% Off Save On Roma Frames! We are positively committed to delivering on our # 9 Core Value: Deliver transparent, open and honest communication. Our goal is to always curate our product line to be relevant and cutting edge! After careful review, we have decided to further discontinue products that are either no long relevant, and/or simply do not meet reorder levels. There are now NEW discontinued items available on Save On Roma at RomaMoulding.com. To find a comprehensive list of our recently discontinued product please click here. Take advantage of savings from 80% off of our amazing Save On Roma frames while quantities last. Final discount prices will appear on your invoice once purchase is complete. Please be aware that free freight shipment does not apply on these purchases. Our Wizards of WOW are available to chat with and assist you with order processing and inquiries. Thank you for your continued support! Do you also sell liners? Hi Romana, unfortunately at this time we don’t offer liners. As is usually the case, I received an email about the great savings on your Black Friday sale, but when I look on the website I can find nothing that mentions the sale. Your website makes it nearly impossible to locate anything but core values and pictures of “All Hands” stuff!! !